Magnetic wand, Use this wand with our magnetic marbles or other magnetized items or pick up those paper clips you just dropped. It has many uses and is fun to watch in action. 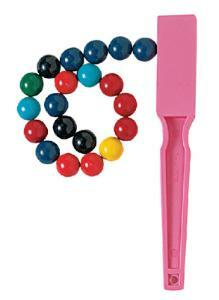 Magnetic marbles, brightly colored magnetic marbles are more fun than ordinary marbles and harder to lose. 5/8" dia. Package of 20. Caution: Warning: This product contains small magnets. Swallowed magnets can stick together across intestines causing serious infections and death. Seek immediate medical attention if magnets are swallowed or inhaled. Choking hazard - This toy is a marble. Not for children under 3 yrs.